Assembling a group of African American military brass and other dignitaries in Frederick, Maryland on a weekday was no small feat, particularly when they traveled from different parts of the country for the occasion. Yet, distance had no boundaries for these men because the task would have a profound impact for generations to come. They came together for a historic reason: first, a luncheon meeting at a quaint Frederick, Maryland restaurant, where they gave perspectives on Colonel Charles Young, an American hero, and how a monument in his honor offered a lasting tribute. After lunch they traveled to sculptor Antonio Tobias Mendez’s studio in the rolling hills of Western Maryland. 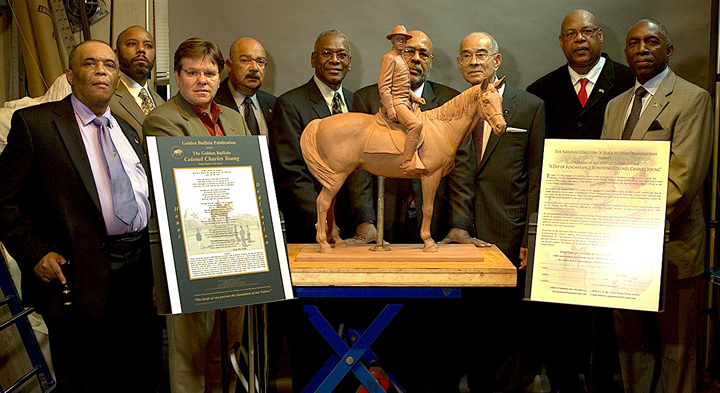 There, they inspected a clay model that Mendez created for the bronze casting of a maquette honoring Colonel Young, the legendary Buffalo Soldier, statesman, and Diplomat. The end creation will be a monument, erected in Washing­ton, DC, to acknowledge Colonel Young and the historic and honorable service that millions of African American servicemen and servicewomen gave in defense of the nation. The inspection team read like a Military Who’s Who, themselves military heroes revered by countless African American soldiers. Present were Lt. General Arthur J. Gregg, USA Retired; Lt. General William E. Ward, USA Retired; Major General Errol R. Schwartz, Commanding General District of Columbia Army National Guard; and Brigadier General Robert Cocroft, USA Retired. Also present were Chief Methuselah Bradley, IV, Honorary Consul for the Republic of Sierra Leone; Mr. Leonard Lawson, Jr., President, BlaqueIce Productions; Mr. Jack Evans, Washington, DC Representative of the Black Veterans Coalition, and Antonio Tobias Mendez. Charles Blatcher, III. Chairman of the National Coalition of Black Veteran Organizations (NCBVO), and the event organizer, reiterated the importance of this recognition. “Born in 1864, Colonel Charles Young’s was an extraordinary life and career. He stands as a great symbol, not only for black servicemen and servicewomen but for all Americans,” Blatcher offered. “The Colonel’s father was a model for the possibilities, serving in the Union Army Fifth Regiment of the Colored Artillery Volunteers during the Civil War. He planted love of country seeds and military service in young Charles who heard the call. Despite great odds, Charles Young became the third black graduate of West Point Academy and rose to become the highest-ranking black officer in the United States Armed Forces from World War I until his death in 1922. Among other achievements, Colonel Young was the first black Superintendent of the National Park Service, and the first black attaché to foreign governments, Haiti and Liberia,” Blatcher concluded. Accolades like these are worthy of merit. However, Colonel Young lived during a time when obstacles owed to his skin color were insurmountable. The NCBVO is seeking to correct the history through working with other supporters to give Colonel Young the rightful receipt of an honorary promotion to Brigadier General. Others in the room agreed recognition of the highest order is long overdue. Following are tributes from the gathering. “Today’s inspection honors a great soldier and a great American. Erecting a statue honoring Colonel Young serves as an inspiring place and presence for all to view,” offered Lt. General Gregg. “Today we have three four star generals out of twelve in the Army. One manages a yearly budget of $13 billion. It is important to embrace policies, programs, and actions that promote equal opportunities in defense of our nation,” he concluded. “Colonel Young was a beacon for so many after him; he persevered when odds were against him,” shared Lt. General Ward. “I am honored to be a part of the inspection of a model for the Colonel Charles Young monument,” he added. Brigadier General Cocroft echoed that view. “The National Association of Black Veterans, in over 36 states with 85 chapters, is committed to preserving the historical records and raising monuments for those of color who contributed to this country. It’s time to correct the historical record and tell the story of Colonel Charles Young’s service beyond the call of duty. A rank to Brigadier General does just that,” he concluded. Chief Bradley knows well the imprint Colonel Young made in Sierra Leone and other parts of Africa. “I am pleased to be a part of this venture,” he shared. “This nation needs the examples, statues erected in honor of the Buffalo Soldiers. Though they served their country with honor, the Buffalo soldiers, African American regiments formed in 1866, were often subjected to prejudice within the US Army. Producer Leonard Lawson spoke of the wealth of power in the room and shared how Charles Blatcher opened his eyes to the pivotal contributions of African Americans such as those of Colonel Charles Young. Jack Evans gave a similar viewpoint, adding that Colonel Charles Young’s legacy is one of re-educating African American and other communities. Sculptor, Antonio Mendez was noticeably moved as he expressed honor and gratitude for being selected for the project, “a monument for future generations that can spark further curiosity,” he shared. The mood in Mendez’s studio drew reminders of luncheon tributes, observing eyes witnessed the birth of a monument for future generations. Words were spoken while viewing the statue, softly and with reverence. One sensed Colonel Young, who served his country to death caused by a kidney infection he acquired in Nigeria, would be proud. Though given a full military funeral and buried in Arlington National Cemetery, a new chapter was unfolding, with those who looked like Colonel Young, and who wore the uniform like he did, scripting the words and images. “Give less folds to the upper chest on his coat, place an insignia on his horse’s blanket, make sure the button count is correct,” spoke volumes. The expectation, and requirement, was to get it right. The clay model is the first of 13 bronze Colonel Charles Young maquettes, one representing each of the original colonies of the United States. Every American can share a role in the movement from maquette to monument. NCBVO requested President Obama accept the first maquette as a gift from the coalition to the nation during Black History Month next year.